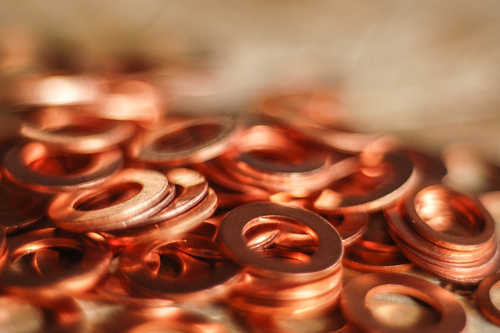 Copper is a soft metal with very high electrical and thermal conductivity. At Qualitetch, we can etch detailed designs into a range of copper and Beryllium Copper metals. Due to the high conductivity of Copper, the metal is used mostly in the electrical, automotive and transmission industries. One of its primary uses is for wiring, especially for heating systems which take advantage of the material”™s high boiling point. Through our Photo Chemical Etching process, the smallest and most delicate designs are made possible. The Copper retains all of its properties, as well as remaining burr and stress-free following the etching. The metal is cleaned once the design has been finalsied, and the sheet covered with UV sensitve photo-resist before printing. The metal is then taken through a chemical bath with ferric chloride, which is suitable for both soft and hard metals. Any trace of photo-resist and chemicals are removed once the process has been finished ”“ the etched parts are then taken for approval by our QA technicians. Qualitetch offers a quick and efficient turnaround, even for the highest of demands, with a high level of accuracy and quality. If you would like more information on the photo chemical etching process of copper, please contact the team on 01354 658787.